The centre of Maldon's High Street is dominated by a restored tower which is all that now remains of the medieval church of St Peter. It stands as a reminder of the Town's benefactor Dr Thomas Plume. 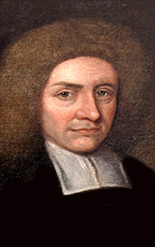 Dr Plume was born in Maldon in 1630 and educated at Chelmsford Grammar School and Christ’s College in Cambridge. While in the employ of the Bishop Hackett of Lichfield his duties included the purchase of books for the Bishop in London. He accumulated one of the largest private libraries of the period containing around 8,000 volumes which included natural philosophy, the classics, history and current affairs. Towards the end of the century, Dr Plume created a school on on the site of the remains of the nave of the parish church of St Peter. This new building incorporated the 13th century tower which had largely survived the neglect since the reformation. The school was situated on the ground floor with a library on the first. Plume had arranged that, on his death, his private library should be moved to this building and this was the case in 1704. The Plume library is one of the oldest reference libraries in the Country and is still housed on the first floor and the ground floor now contains the Maeldune Centre. The Plume Library is situated at the Junction of the High Street and Market Hill Maldon. 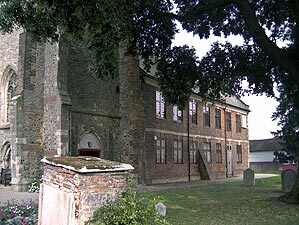 On the death of Dr Thomas Plume in 1704, his books and pictures were bequeathed to the town of Maldon with the intention that they were to be used by the local clergy and any gentleman or scholar who so desired. During his lifetime, Plume had provided a permanent home for his collection of books by converting the derelict church of St Peter's, the nave of which had collapsed in 1655. Thomas Plume paid for this to be replaced by a handsome red brick building in the domestic fashion of the period and he had the tower rebuilt in a traditional Gothic style. The upper storey housed his library and Maldon Grammar School and later the National School occupied the lower room. About 7,000 books and pamphlets had been amassed by Plume and left to the town. This is a sizeable collection and much greater than other similar private libraries of the period. Because he brought secondhand books in mixed lots at auction, the collection contains works dating from the 16th and 17th centuries and because he never properly sorted them, there is a random character to the resulting stock of the library. As might be expected of a high ranking clergyman, over half of the books are theological in content, with published sermons and commentaries on the scriptures. The library also reflects the ideas and advances made in the 17th century in Natural philosophy; chemistry, medicine, physics, mathematics and practical mechanics are included. So, too, are books on astronomy. Whilst Plume was Vicar of Greenwich the first Royal Observatory was built in his parish and later he founded the Chair of Astronomy and Natural Philosophy at Cambridge University. As far as is known, Plume never had any of his own writings published, but he did edit and arrange for publication a collection of sermons by his friend Dr John Hacket the Bishop of Lichfield, a copy of which is in the library. Plume wrote a biographical memoir of Dr Hacket as a preface, but he was careful to retain his own anonymity and only referred to himself as a friend. In his will, Plume provided funds to pay the salaries of future library keepers who were expected to be university graduates and men who knew books. He also directed that twenty shillings a year were to be spent on new books. Most of Plume's books have survived the intervening years, although approximately 700 are missing from the original collection. Some 2000 other titles have been added, including the library of the Revd Russell Horwood, Librarian from 1850 to 1901, a bequest from Dr J. H. Salter of Tolleshunt D'Arcy and books from the Maldon Literary and Mechanics Institute and Beeleigh Abbey. Due to the foresight of the bequest, the library is still managed as a private Trust and since 1988 the Trustees have had the support and assistance of the Friends of Thomas Plume's Library. Originally taken from notes by Dr W. J. Petchey.